I also think sort of the chasm, between, or the bigotry expressed against Muslims in this country has been one of the most disturbing stories to surface this year. Of course, a lot of noise was made about the Islamic Center, mosque, down near the World Trade Center, but I think there wasn't enough sort of careful analysis and evaluation of where this bigotry toward 1.5 billion Muslims worldwide, and how this seething hatred many people feel for all Muslims, which I think is so misdirected, and so wrong -- and so disappointing. I know that sounds crazy, I know that sounds crazy. But The Cosby Show did so much to change attitudes about African-Americans in this country, and I think sometimes people are afraid of what they don't understand -- like you, Mo. Rocca said "I think religion should be taught as an academic subject in public schools." Couric said "I totally agree with you." But left unsaid is this: how well do network news people do in explaining the tenets of Islam or any other world religion? If there's great ignorance of Islam in America, Katie Couric has done nearly nothing to solve it -- and nominating Hollywood to solve the problem with a lovable family comedy isn't really taking responsibility. 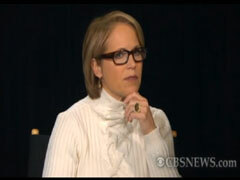 No one on the set wondered if Couric was being reckless in taking the idea that many Americans had -- that a mega-mosque two blocks from the hole of Ground Zero was insensitive and should merely be located somewhere farther away -- and wildly extrapolating that with "seething hatred" of "1.5 billion Muslims worldwide." It might be Islamophobia, Obamaphobia, or both, but when loud speakers are blaring ‘Born in the USA’ and signs say ‘No Clubhouse for Terrorists,’ it’s clear we aren’t just talking about a mosque anymore. There is a debate to be had about the sensitivity of building this center so close to Ground Zero. But we can not let fear and rage tear down the towers of our core American values. What about the Nashville floods? Larinda Sue [sp] on Twitter asks if the Nashville floods will make our list, and it made all of us think, as w're preparing for the show...what other stories were underreported? The Nashville floods were really underreported. Anything else come to mind that we should have been paying attention to that we didn't? I would say we're probably not paying enough attention to Iraq. Does anyone else agree with that? Martin agreed and said "We're in danger in the media, but also as a people, of becoming inured to war, sort of a permanent war," and "because there's no draft, a lot of us don't have skin in the game, as they say."